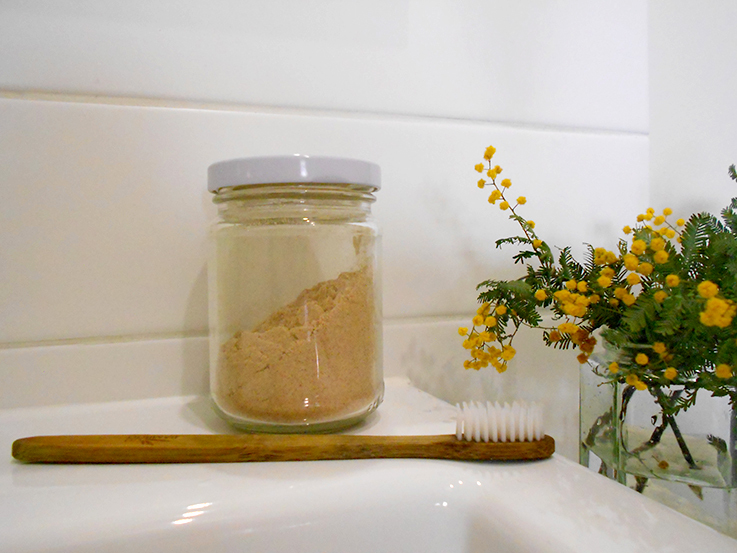 My toothpaste was one of my first personal care items that I swapped for a plastic free home made alternative. My first batch was made of bicarb soda and mint. 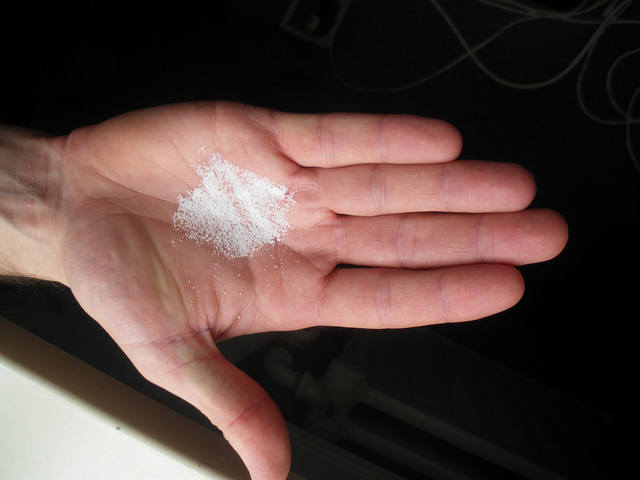 The Builder being his usual supportive self gave my toothpowder a go. The first two weeks went by and we were happy with the switch to plastic free toothpowder. Then the mint began to fade. Instead of the fresh zing we started with we were left with a bicarb taste. It was not pleasant and the Builder fell off the wagon and swapped to an organic toothpaste. The minty taste was not lasting and it could never mask the bicarb flavor enough. Out of determination and stubbornness I stuck with it and began experimenting using different ingredients. It was not just the plastic and packaging that kept me away from store bought toothpaste. After all TerraCycle allows fans to recycle their toothpaste tubes. It was the different chemical compounds plus the added fear of plastic microbeads in popular toothpastes that guided me to make the switch for a homemade tooth powder. Since I brush my teeth twice a day, everyday I wanted what ever I use to be safe, friendly and taste good. I wrote here about my promise that I would only put ingredients onto my body that I can put into my body. Simple. Kind. Handmade by nature. 5 ingredients or less. Making my own products affords me the knowledge and reassurance that there is nothing toxic and harmful making its way into my body or the environment. I tried different combinations of coconut oil, mint, activated charcoal, salt and clove oil. But none of the recipes out there left a good taste in my mouth. I liked the hint of clove as it had a lovely fresh taste. I decided to match clove oil with sweet orange oil, cinnamon and bicarb to create a warming toothpowder. If you are from the northern hemisphere this will have you thinking of Thanksgiving and Christmas. Add the bicarb into a jar. Add the clove oil. Put the lid onto the jar and shake vigorously. Open the jar and add the orange oil. Close and shake again. Add 1 teaspoon of cinnamon powder and give a final shake. If you want to make it a paste melt down 2-4 tablespoons of coconut oil and add to the mixture. Clove oil is antimicrobial, anti-fungal, antiseptic, and antiviral. Used for centuries in dental care clove oil continues to be a popular ingredient in mainstream toothpastes. You might see it on ingredients list as eugenol. Even though this is a natural product use with care. It is a painful product if used incorrectly. Sweet orange oil is anti-inflammatory, antidepressant, antispasmodic, antiseptic and boosts immunity. Plus it blends well with clove oil. Cinnamon is also antimicrobial, antiviral and anti-fungal. This toothpowder has the thumbs UP from the Builder. I try not to make more than 5 table spoons at a time. This is so the powder keeps its taste. This quantity will last 3-4 months between the two of us. You might think that paying between $15-20 for a oil is a bit much. Remember that these oils hold multiple uses and usually have around 100 drops per bottle. Clove oil is great for mould and mildew. Orange oil is perfect in home made household cleaning products. I have a dentist appointment due in two months. I won't tell them what I use just to get an open and honest assessment of my teeth. Dentist approved! Essential oils are not the perfect plastic free or zero waste item to buy. Check out Tiny Yellow Bungalow's recommendation on whether essential oils are necessary and choosing a more eco friendly option. 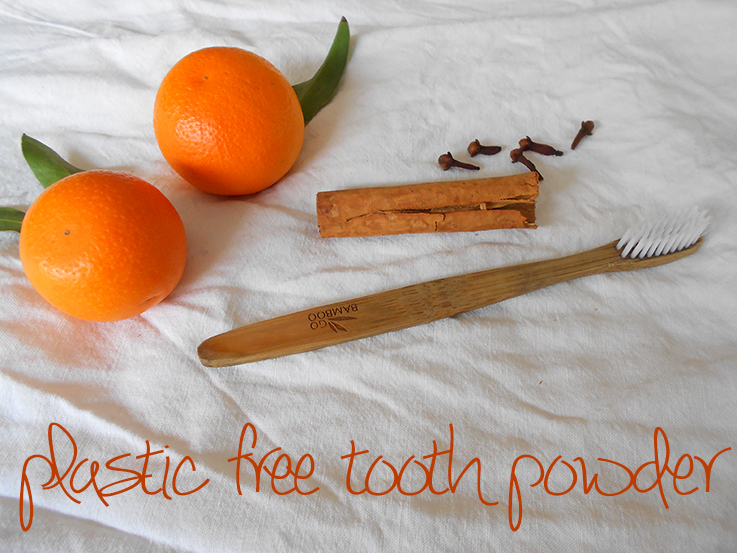 Do you make your own plastic free toothpaste/toothpowder? My blog has been nominated in the Social Good Category for the 2014 Bupa Health Influencer Blog Awards! 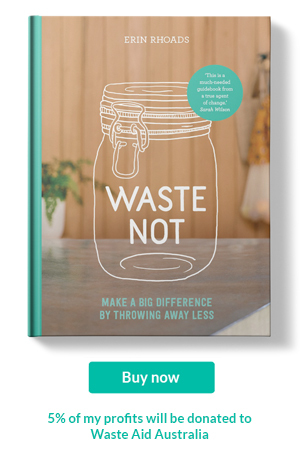 What does healthy living have to do with plastic free, wasting less and sustainable living? My life has become healthier because I have eased back on plastic. I am no longer tempted by store bought treats because I can’t buy anything packaged. If I want to feed a sweet tooth craving I reach for a piece of fruit whose packaging I can compost as nature intended. I support local farmers because the food has less of a distance to travel, meaning a smaller carbon footprint. This has resulted in meals that are all organic and chemical free. None of my food comes wrapped in plastic. I say no to plastic wrapped food because most plastic that food comes wrapped in will never go away and adds harmful toxins to this earth, which is where I ultimately get my food. I would love everyone to understand and I blog for the reason to simply make people realise how silly some plastic can be. I want the next generation of Australians to not worry about pollution in our oceans or weird GMOs in our food. I don’t want another generation of young people to slather themselves in toxins for the sake of beauty. And then have the packaging build up in our landfill. I want people to understand that recycling, while fantastic, also taxes our resources. I want the word reuse to become popular again like it was for our grandparents. I want a generation to make choices with wholeness and meaning. I want people to be aware of the actions they make and the companies they support, and understand how they affect all people all over this world. Because everyone in this world deserves to live a healthy life. 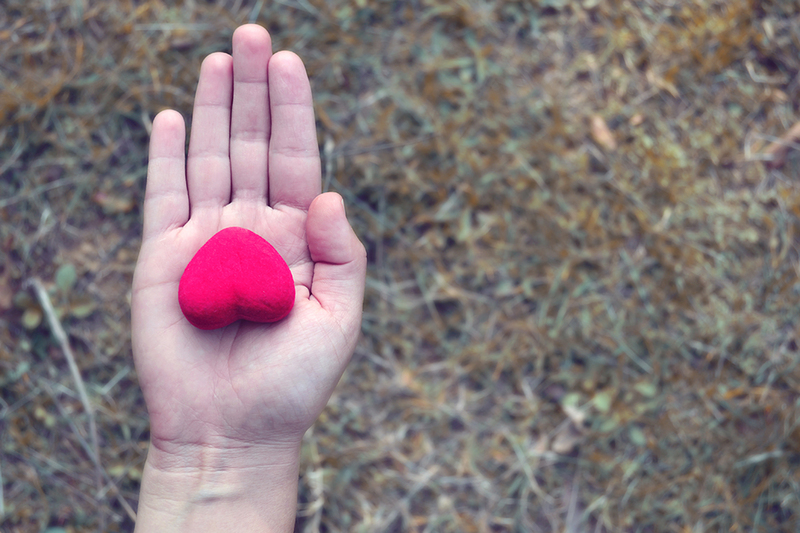 Practicing sustainability is to practice generosity. These choices make me healthier. If the earths health suffers, everyone's health suffers. I am not sure what happens next with the nominee thing. If I progress to the next round I will let you know. In the meantime I will keep blogging about living plastic free. Some weeks ago my family visited from interstate. While they were here I asked my green thumbed parents to give me some pointers on what I can do to make my garden flourish. Within a couple minutes of seeing my garden Mum declared I needed fertiliser and mulch. I confessed I had not used any explaining that store bought fertiliser and mulch comes packed inconveniently in plastic. I was kinda wishing the garden gods would see my plastic free life and grant me a bumper crop without the need to add fertiliser. You know, doing well for the planet by giving up plastic and be rewarded with vegetables. It was a simple wish. Unfortunately this had not happened and Mum explained that although my soil was organic, it was lacking nutrients and needed a serious boost. I had a memory from my high school ancient history class that seaweed was used as fertiliser throughout coastal regions in the United Kingdom. I read up on seaweed to make sure a trip to the beach was not made in vain. Turns out my memory served me well and seaweed is in fact a fantastic FREE resource to use on the garden, working as a fertiliser and a mulch. Works as a deterrent to slugs (yes, I so need this!). When seaweed dries it is scratchy and slugs don’t like that on their bellies. I tried wood shavings but that did nothing and the slugs had a party, with my lettuce being the main course. Add in the salty factor and my garden beds won’t be a hang out for them either. Full of good minerals that will turn soil into a nutrient rich place to grow vegetables. Will also help loosen compacted soil by allowing more air in as it breaks down. This is something that I have trouble with and am out there each weekend breaking up the soil so water can get in properly. Mulch, I have learnt, keeps the soil from drying out. 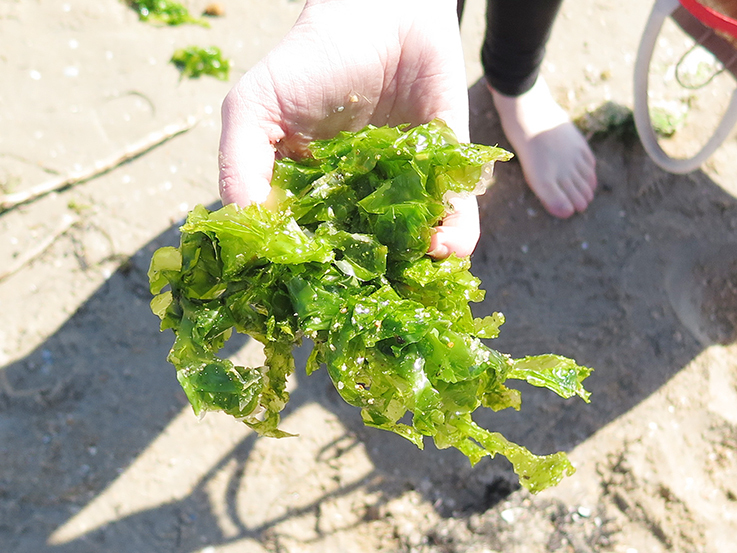 With summer not too far away (and its predicted to be a hot one) the seaweed will reduce moisture from evaporating. Less weeds. I don’t have too many but better to ire on the side of caution. 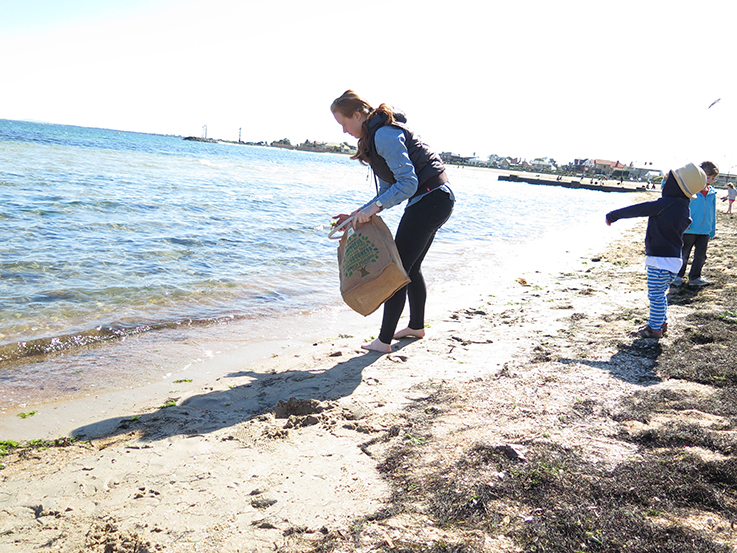 Now, before you jump for joy at a package and plastic free fertiliser for your garden we did discover plastic in the seaweed; plastic in the form of pollution. 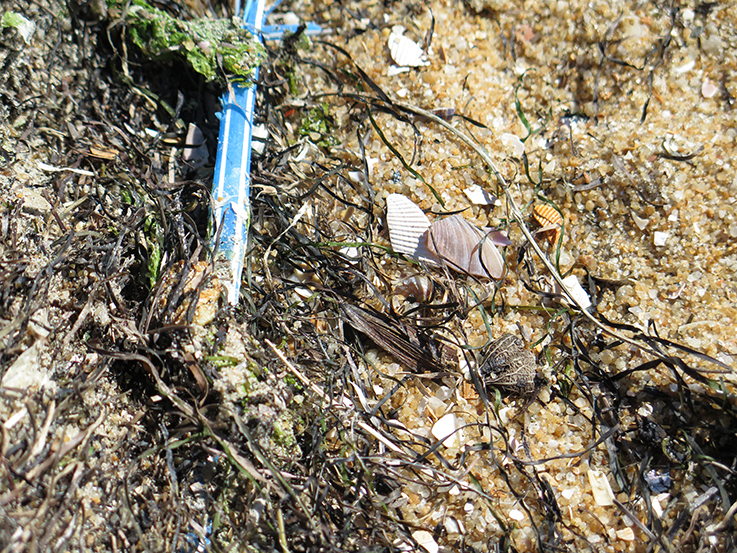 We gathered ours from a popular public beach and this would explain why there was so much. I found the best way to get it out of the seaweed before laying it onto the garden was to submerge in water and the plastic floated to the top and sand sunk to the bottom. I have written about microscopic plastic before and I was worried it would make its way into my garden. I am hoping most of it came off when I rinsed it. Which ultimately ends up back in the ocean I guess. Maybe I am not feeding my garden plastic free - but how will I know without using a microscope? Another good reason for everyone to stop using single use plastic. The plastic that I did wash off and could see went into my ‘save from landfill – could be recycled one day’ box. I don’t live near the ocean. Where can I get unpackaged and plastic free fertiliser for my garden? The best answer would be to ask around. Gumtree.com.au helped me locate the following options below. My back up option was to ask local gardening communities. 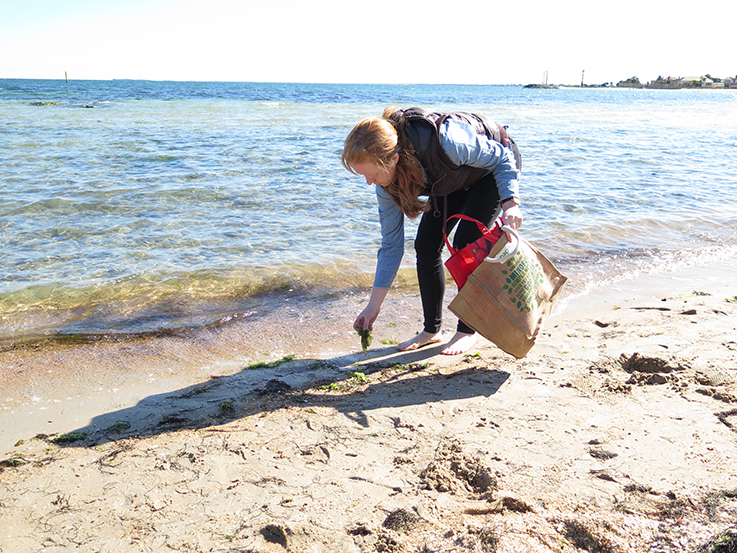 Before I foraged for seaweed I was able to contact a organic farmer that sold bags of manure. I told him about my plastic free life and asked if I could bring my own container. The farmer obliged and said he would be more than happy to reuse the bag for himself. This did require me to drive 45 minutes. I like to think that the drive would weigh up better against the creation, delivery and pollution problem of buying new plastic. Plus I am helping a local farmer. I was also lucky to discover a married couple in Melbourne that sold cut up lucerne hay in paper bags. After I worked the manure into the soil and topped with seaweed, I then layered hay on top. The paper bag did come with staples that I have collected for recycling. And I can reuse these paper bags until they are ready for the compost. The Builder and I planted vegetables for our spring/summer crop. I am hoping that with these added soul nourishing elements our garden will be feeding us well over the next two seasons. If you know of any other package free gardening alternatives that enriches the soil please share below. You may have heard about microbeads and the rush to get products that contain these small and dangerous balls removed from skin care. Microbeads are plastic beads put into products to aid in the exfoliation process. Exfoliation is the removal of dead skin cells resulting in a fresher and glowing appearance. In reality microbeads are harming our waterways with the potential to harm us. There is a worldwide push to have these beads banned spearheaded by Plastic Soup Foundation and Stichting De Noordzee through their campaign Beat the Microbead. As a shopper you might not know these beads have been added to your product. With the beads being so small your eye would not see them. The front label does not state that you are potentially scrubbing your skin with plastic. You might think what is the big deal; if they are so small what damage could they do? These beads end up in our local sewer system and the treatment plants have not been made to pick up these microbeads. Due to their minute size the beads escape into the ocean. Like most plastic, these beads will not break down as they are not biodegradable. From here animals take in these beads and bringing the plastic into the food chain and ultimately into our bellies via the seafood we consume. Beat the Microbead do not think this is fair on the environment and animals that call our waterways home. They are campaigning to get global companies to remove the beads from products. So far they have achieved promises from Johnson & Johnson, Procter & Gamble, The Body Shop, L'Oréal, Colgate-Palmolive, Beiersdor and Unileaver to phase out microbeads. Sadly, this could take years. There are legislations being championed to ban any form of microplastics in states of the US and the European Union is also seeking a legal ban. While I advocate NOT buying anything in new (virgin) plastic, I understand that this might not appeal to everyone. After all we are all on our own journey, to limiting plastic in our lives. 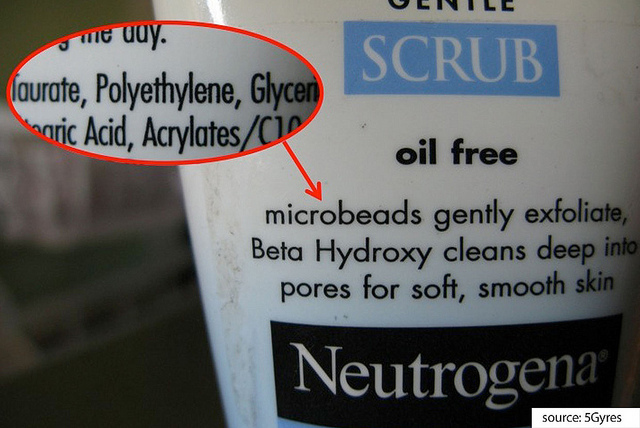 So what can YOU do to Beat the Microbead? 1. Stop and check the label. While some companies have promised to remove microbeads, they have no done so yet. If you find the word polyethylene in the ingredients, put the product down and back away slowly. Beat the Microbead have also put together a handy app, so you can suss out if plastic is in your fave toothpaste, body scrub or face scrub. Then sign this petition and contact your local politician too. 2. If you realise that a product you currently use has plastic beads in it, STOP using it. Package that baby up and send it to the head office of the parent company. Maybe include it with a letter. 3. Download this app so you can enjoy exfoliating without polluting the waterways. If you are living plastic free or zero waste then I bet this ingredient lurks somewhere in your home. It is a multipurpose wonder that can be used as an exfoliant I use it once a week. Lemon contains alpha hydroxy acid and works by loosening the dead skin cells so they can be removed easily. Keep the skins and submerge them in vinegar to create a safe cleaner for your home. I love multipurpose uses for things! Did you know hemp is antibacterial? Well it is. Natural hemp has a slightly courser texture making it the perfect fibre to slosh away dead skin cells. When you are done with it, toss it into your compost bin or plant beds. Paris To Go knitted her own, check it out. We have all read about sugar being not so good and for some of us that indulge will sometimes see results in our skin. When used topically sugar works as a wonderful scrub. With the combination of glycolic acid and it's granular texture your skin will be looking so fresh and so clean! I am allergic to coffee (I know, I know...) but that does not stop me from "borrowing" a cup from the Builders stash to give my body a good scrub. It is too harsh for my face and leaves me looking red so I use it exclusively below the neck. Oatmeal is perfect for sensitive skin. It is moisturising and will help with any inflammation your skin might suffer through day to day pollution. Mix with honey for a nourishing face mask too. Mmmmm yum. 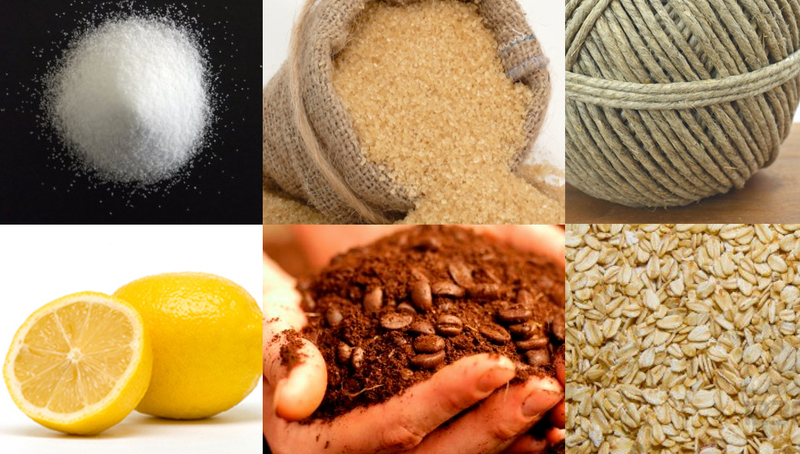 There are many other natural exfoliants. Tell me, what is yours? Last weekend I was walking to the train station. It was a beautiful sunny afternoon and I was on my way to visit a friend. My joyful walk was interrupted by a billowing pink form moving across the street. It was a plastic bag that had escaped from a mailbox put there by a charity clothes collection. It was not the only bag that I encountered on the walk to the station. I picked up five bags! It was disheartening especially with the proximity of this street to a river. Not to mention the grumpy mood these wandering bags put me into. The clothing charity company, like other charities, has good intentions. They want to take unwanted clothes and sell them on for money that will be donated to those in need. The plastic bag creates ease and convenience so people like me will participate. All they ask is that you put your clothes into the bag and leave on the door step for collection. I only walked along one street that day and I wondered how many other streets had pink plastic bags floating about that had the potential of ending up in the waterways close by. I give away clothes frequently and I know a plastic bag is not necessary. As I sat on the train with a big ball of plastic bags, stuffed into my handbag it got me thinking about charities and the misuse of plastic. There was a recent charity drive by a group in the CBD. Each year I give money to this group and take away a little pin (made of plastic!) that ends up sitting with pins I bought from previous years. But this year I decided to not take the pin and left my money only. The man was baffled and was looking through his paraphernalia to give me something, anything. I explained that I did not need anything in return. He straightened up and smiled at me, thanked me for my donation and I went on my way. There are many charities that ploy a donation with the promise of pens, hats, fake noses, bags/pins, wrist bracelets, toys, sweets...the list goes on. If we keep going at this rate we will need just as many charities raising money to deal with the pollution as a result of our thoughtless choices. I don't mean to come across as attacking charities for their hard work and dedication. I simply think there is a better way and ultimately this also falls to us, the people who donate. Truth is, the tokens would probably end up in a junk draw. Prized for a few a weeks then tucked away. How can we know where these products are made - the impact they had on the environment or a community during the production process. Not to mention tha one day be removed from that junk draw and make a journey into landfill to sit for who knows how long. This is not charity. This is mindless pollution. I ask you that when you are passing your hard earned cash or goods over to a group in need, ignore the temptation to seek a physical reward or follow convenience. Mention that it is a waste of resources and that they should not give out products that will never go away. The act of giving is enough. The earth will be better off and so will generations to come. Recently my brother and I had a conversation about my lifestyle. He made a valid point that I need to meet people halfway. For instance some may want to live sustainable but the thought of buying second hand clothes is not appealing and find buying only local limiting. No one wants to be limited and I don't ever want anyone to feel limited on their path to sustainability. It got me thinking about local and what it means in our ever expanding world. That is why I was interested to meet Jacob & Esau an Australian sustainable clothing line that invites you to Meet the Maker. I heavily promote buying local if people don’t find joy in an opportunity/thrift shop. 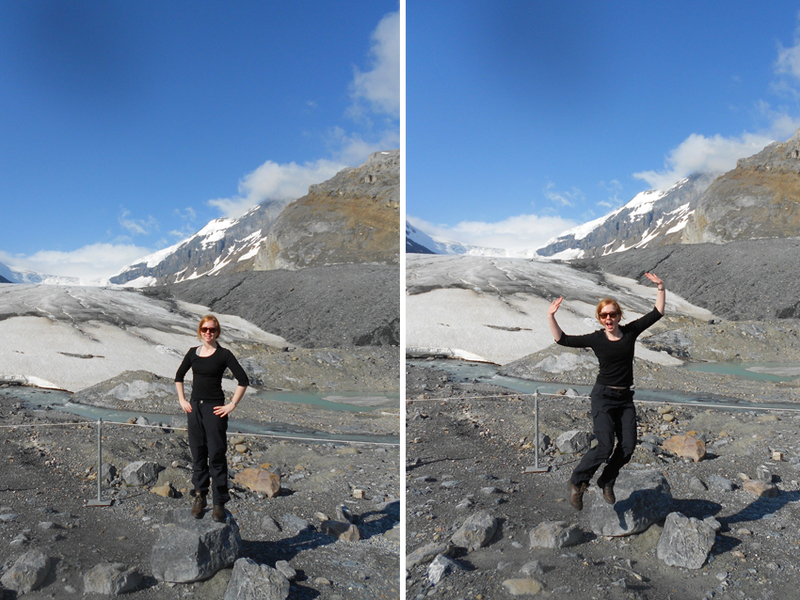 I realised my stance, had good intentions, was slightly ignorant. Turning my back and forgetting the conveyor belts of fashion fed from unsustainable brands that litter our malls and streets was not fair. It was neglectful. I questioned how I can make a change beyond boycotting all overseas fashion goods. Instead I have decided to celebrate the pioneers who are putting their heart and soul into setting up companies overseas that promote ethical business models, supporting their workers with fair wages and providing opportunity for men and women to work a skilled job with dignity. 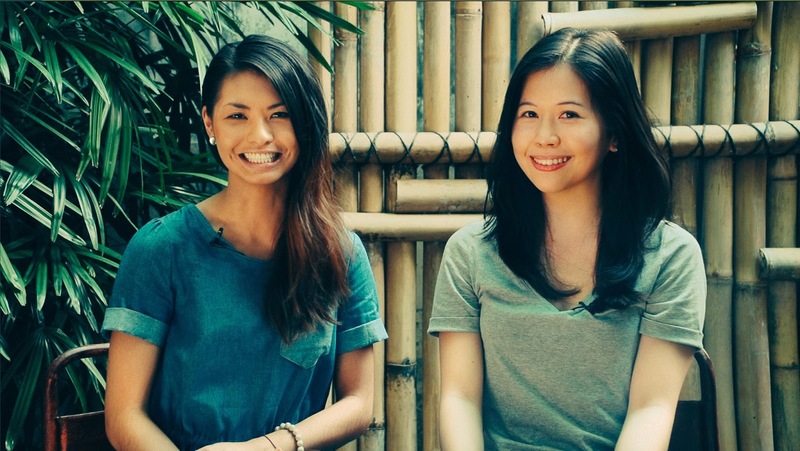 The talented and forward thinking founders Joanne Yu and Esther Chin of Jacob & Esau want to take it a step further by inviting the shopper to meet the tailor who made their clothing. Each item will carry a code which the wearer can key into the Jacob & Esau's website to learn about the person who made the item. The feature is called Meet the Maker. It reminds me of what it would have been like in the days when you knew your tailor but with digital edge. 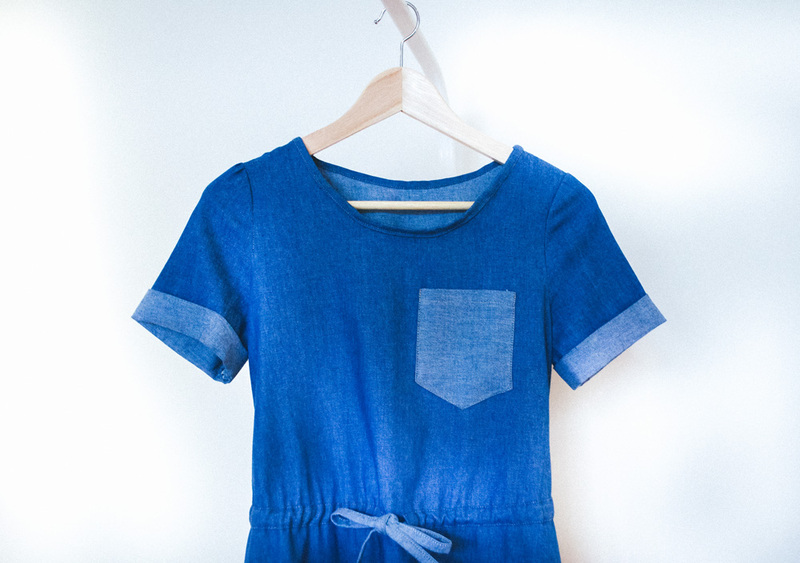 A simple and kind idea that makes a garment sewn time zones away feel local. Jacob & Esau do not plan to engage large manufacturing factories, but instead source from garment makers of whom they desire to invest their time and money in. At the same time, they can ensure fair treatment and wages of the people they employ. The last thing they want to do is take advantage of the cheaper costs resulting in less than desirable conditions of the workers. They are determined to be different from the norm, even if it meant that they would need to pay more and not have a short turnaround time to have garments made. 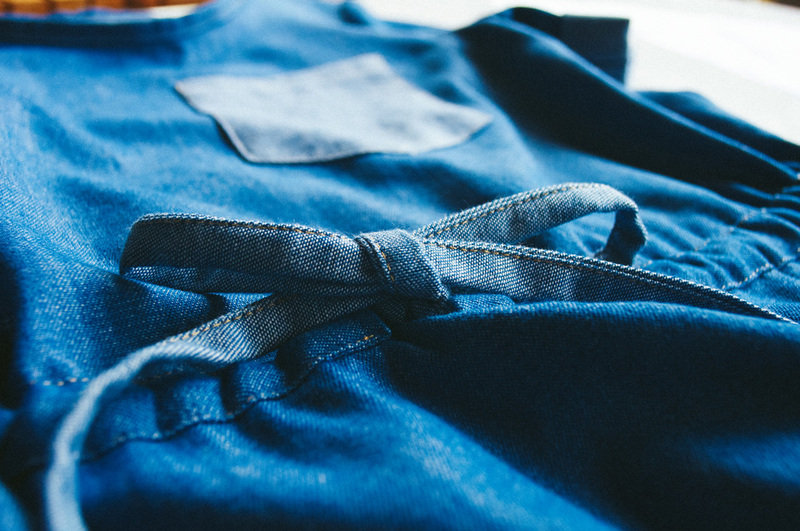 Their aim to use natural fibers over synthetic, allows for longevity through wearability and the life cycle of the garment. Meaning it can be layered (due to breathability), worn for many different occasions (for example as casual daywear then over time for exercise and even as pyjamas as the garment loses it's 'newness'! ), used as rags or cleaning cloths and then finally broken down naturally in landfill. This is my kind of thinking. They support a local textile supplier in Bali whose primary source of cotton is from the neighbouring islands in Indonesia. They stock quantities on site, which allowed them to purchase the fabric on the spot rather than importing it from other suppliers. This minimises the carbon footprint left from shipping and transport. The first line will be made by a Balinese married couple, Kholil and Wiwik. But before these two talented tailors get started a donation is necessary to kick start the dream. Already Jacob & Esau have raised $6,295 and need $15,000 to launch their summer collection. Let's help them! J & E has an exciting vision for the future of sustainable fashion and need the support of people like yourself to have our first ethically produced collection made Pozible! Visit www.pozible.com/jacobandesau to help turn this dream into a reality. I have a feeling Joanne and Esther are setting the foundation that will help turn the fashion industry around and bring about more respect to the people that make clothes. Making clothes is no easy feat and the people who do this deserve to be rewarded fairly for their hard work. If you would like to know more about their story jump to their website, www.jacobandesau.co and watch their gorgeous video. Ah, it is super inspiring. Don't forget to share this post with your friends. I am going to let you in on a secret...I don't really wear deodorant. What I wear for a deodorant is a popular question I get asked when anyone discovers I don’t purchase items housed in plastic and prefer a zero waste life. The question is asked with good reason too as standard deodorant comes in plastic packaging. Read on to find out my DIY natural homemade plastic free deodorant that is also zero waste friendly and get to know your pits. I have tried home-made deodorant using bi-carb soda as a base, tailoring with coconut oil or coco butter and essential oils to form a paste. There have been attempts of straight bi-carb on the pits and a bi-carb/tapioca mix. Sadly none of these worked for me. I found my underarms would break out in a red rash. And if I am breaking out in a rash that is my skin telling me to back off and use something else. But let’s wind back and talk about armpits, sweat and smell. Because it took me learning about how this area worked to believe that my own deodorant recipe would be OK and not render be friendless. Armpits are made up of sweat glands and hair. The area also generates heat and would explain why you see people fold their arms and put their hands near the armpits on colder days. The sweat glands produce sweat throughout the day. If you are exercising then you will produce more and sitting still will mean less sweat production. Many different factors can affect body odor like diet and genetics but there is one thing that we all have in common that creates a smell; bacteria. It’s completely normal so don’t freak out. But the best way to help eliminate smell is to wash really well. I wash thoroughly in the shower with soap and a wash cloth each morning. I also wash under my arms after I brush my teeth in the evenings too. Previously when I used regular deodorant I did not pay that much attention to washing my armpits and no doubt did a lazy job. After all I had deodorant that I purchased to deal with that any smell. Sweat does not smell - it is the bacteria that causes the smell. Simply by washing your armpits thoroughly you will find that using homemade deodorant successful. Even though the hair is there to help eliminate odor under the arms, most ladies (and even gentlemen) shave the hair and regular shaving does take away that layer of bacteria too. But you still need to wash with a simple natural soap. After I finish washing, I pat dry the area and apply my one part apple cider vinegar and one part filtered water deodorant. Yes, that’s all there. I keep it in an old spray bottle that I had. You could easily put this into a bottle and splash it on old school style. The apple cider vinegar is bought in bulk and the water…well that just some from my tap. Apple cider vinegar helps balance pH levels of skin so it is a gentle and effective number to keep on hand. Plus most bulk food stores have this item in stock. Put into bottle and shake. I then dab on my perfume which is usually a lush essential oil from Perfect Potion (my fave is Umi at the moment) and go on my merry way. When I began using this mix I let one of my girlfriends at work know and asked her to tell me if I ever smelled off or weird. It has been five months and all is going well between the pits. This formula has an EWG rating of 1 (hooray!). Meaning no weird chemicals are getting into my body like the usual shelf bought products.You can read here about chemicals found in most deodorants. Plus who knows what kind of chemicals leach out of plastic and into products I used to buy. Oh and it is really, really cost saving. I would love to hear if you use homemade deodorant and tell me in the comments below what worked and what did not? If you liked my post please share and lets have some love for the pits. How important is music in your life and why? Every morning I wake up to music and will have a dance off with my man for fun. But to me it is not myworldwouldend important. I might not listen to any music for months and then have a couple weeks where I am not seen without my earphones. My necessity for music goes in waves. I think it was more a necessity when I was younger. Right now I am in a music wormhole with Patti Smith, Lana del Rey, Talking Heads, and Alabama Shakes on high rotation. What is your fondest childhood moment? I have boxes and bundles of fond memories from my childhood, tucked away into the memory bank. My childhood was pretty rad. I grew up in a small country town, with state and national forests on either end of the Shire. The beaches of the beautiful South Coast were not far away too. My grandparent’s sheep and cattle farm featured heavily and was the ultimate playground. There were many adventures, days of dreaming, playing, creating and laughing. It was idyllic and I am grateful for the childhood my parents worked hard to give me. I became good friends with a girl that lived next door leading to a lifelong friendship with her family that has spanned almost three decades. Our fathers put a gate in the fence, so we could get to each other, without scrambling over the fence when we were little. When we get together we often unravel a memory or two with a smile. What are your three essential items that go everywhere with you? Refillable water bottle. A hair tie. Money. What is one book that you would recommend to someone else and why? The Story of Stuff would be the book I would thrust onto anyone who was looking for a book recommendation. In fact, I wish this book was on the school syllabus across the country. It explains where everything we buy comes from and the mass effects our daily spending can have on people right around this earth. It is a wake-up call we all need. What is one of your annoying habits? Daydreaming. I can get lost in a thought and not emerge, which is annoying if you want to get my attention. Not having my phone on me constantly is also an annoying habit for family and friends. 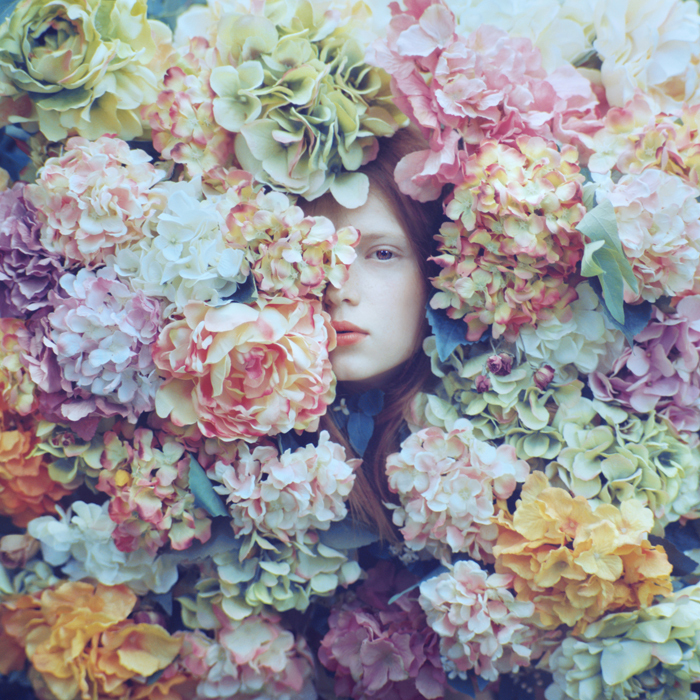 Where is your get away when you want to hide from the world? The movies. There is something so indulgent about sinking into a seat in the dark and being swept into a story with a room full of strangers. For a few moments as the credits begin to roll at the end I feel connected to everyone in the room because we had the experience together. It’s comforting. If you could go to dinner with someone dead or alive, who would they be? And why? My friends and family. I don’t have idols as such. There are people I like that have done great things and are famous for those actions, but on the whole my loved ones, the ones I know will make me laugh would be the ideal dinner guests. Do you have a routine for switching off for the night, if yes, what do you do? I have never been someone that had trouble sleeping. Once my head hits the pillow, I fall to sleep pretty quickly. If on the odd occasion I am struggling I will read a couple pages of whatever book is on my bedside table. Right now that would be Pushkin selected poetry. Valerin tea or skullcap will also help me fall asleep. This is tough. I don’t think I can pick just one as it depends on my mood. Stealing Beauty is a fave... Friend Green Tomatoes, Billy Elliot, Bridget Jones Diary, Little Women, Thelma and Louise, Raging Bull, Forrest Gump, The Sound of Music, Anne of Green Gables, Dr. Strangelove, My Fair Lady, Doctor Zhivago, Lord of the Rings, Harry Potter, Dances with Wolves, Annie Hall, Out of Africa, Legends of the Fall....nope, this is too hard. I could be here for days. However my favorite TV shows is easy - Parks and Recreation. Where is your dream get away place? Right now my dream get away place is the Faroe Islands or Greenland…this list could go on. There is no real motivation other than I simply enjoy it. If you love clothing made of natural fibers, there is a 99% chance, it will end up with those small annoying balls. You know, pills. This does not mean that sweater should be shoved to the back of the closet or donated to a charity store. 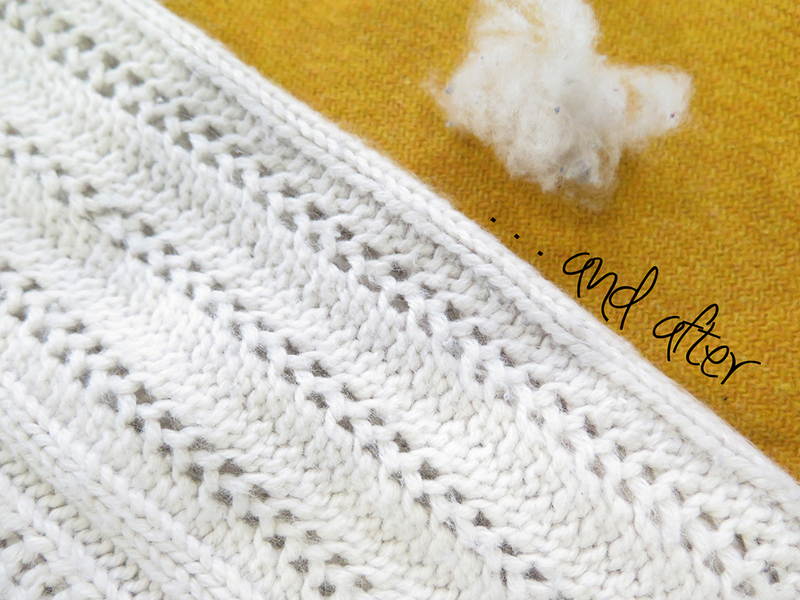 Try a sweater comb to look after your fave items. Pills are not the most attractive accessory. 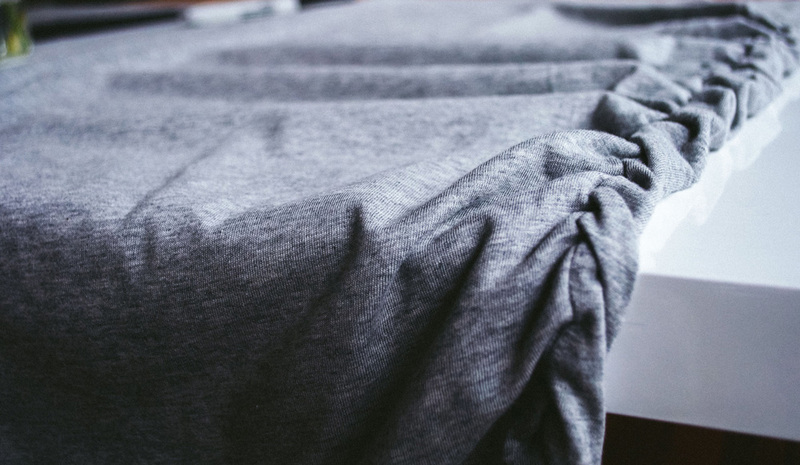 Just because a piece of clothing may pill, does not mean it's defunct or cheap. Those little balls are the result of fibres, that have broken away from the thread and rubbed with others fibers, to become a ball. You might find they appear in places where your garment rubs. 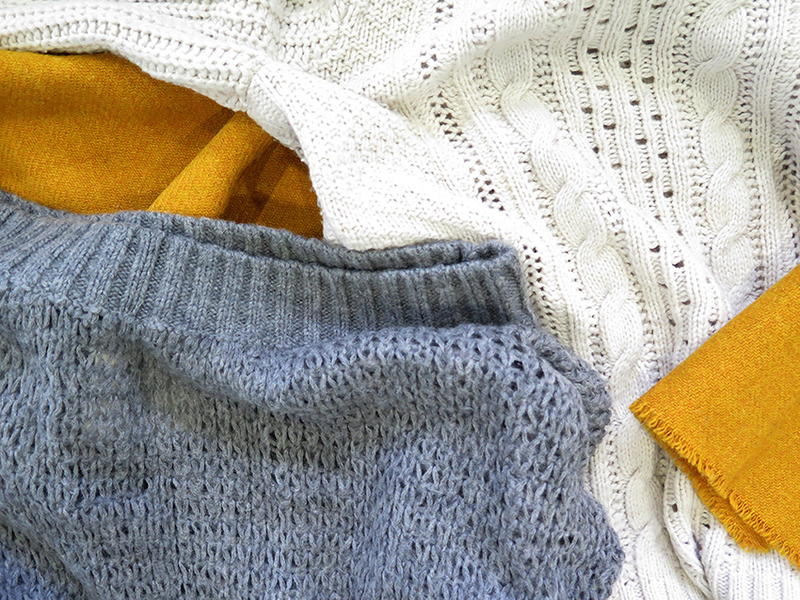 And if you are an Op shop/thrift store lover or clothing exchange fashionista, don't let those little balls stop you from picking up that second hand cashmere top. 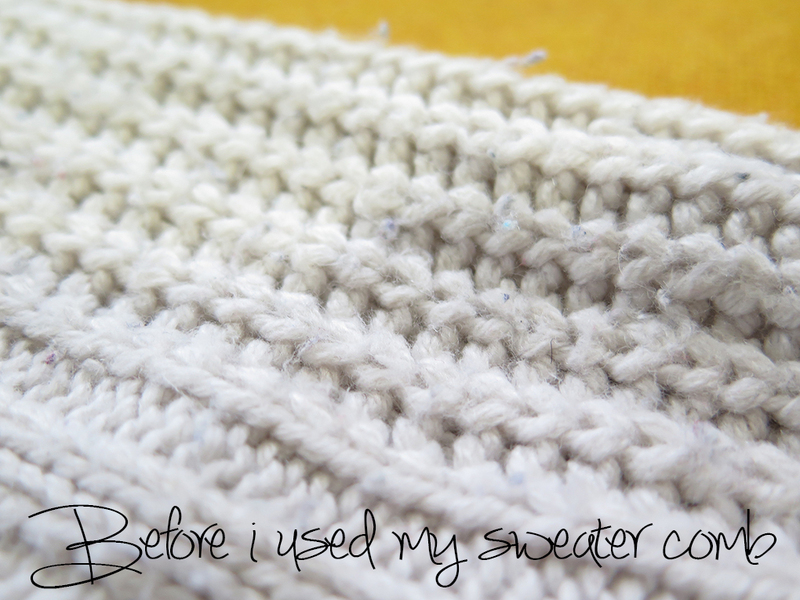 Sweater combs are super easy to use. Simply run the comb along the area where the pills are. The pills will lift off and can go straight into a compost bin if the garment is solely made of a fiber that can break down naturally like wool. These plastic free wooden options will have your clothes pill free in no time. If you don't want to invest in a sweater comb, try using a razor with extreme care. Another way to decrease the risk of the pill, is to hand-wash garments or place them inside a wash bag on a gentle short cycle. What tips do you have for removing pilling?